Meet Darryl Porter, a proud father and grandfather who enjoys cooking for friends and family. He’s a boy scout cycling master and an ordained deacon. A soft-spoken and polite family man, Porter is an avid fisherman who enjoys the outdoors. Yet this mild-mannered and well-liked Chicagoan strikes anger and frustration into residents immediately upon seeing him on the job. 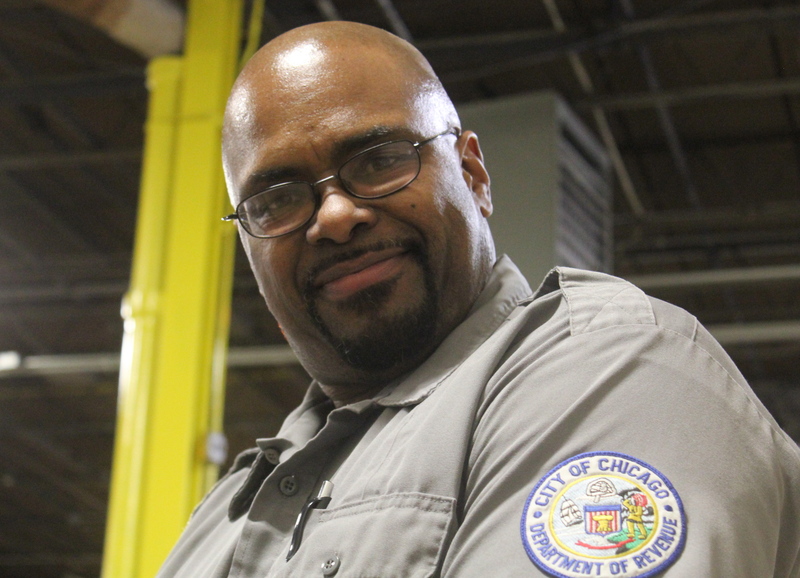 His badge reads City of Chicago Department of Revenue, and his job title is booter. Porter and 37 of his colleagues are responsible for installing and removing Denver Boots on all vehicles that have two tickets older than one year. That adds up to more than 530,000 vehicle owners responsible for paying millions of dollars to the City of Chicago. The City of Chicago employs 38 booters who bring in an estimated $30 million for the city in revenue each year. Porter said he’s seen a lot of changes since he started working as a booter 17 years ago. At that time, two workers were assigned to each van and given a list the size of a telephone book of expired plates But Porter said being a booter today means being a laborer, a data entry tech and a driver. all plates. Booters head out on assigned routes, then if a scanned plate matches a plate number in the system, an alert sounds and the booter quickly identifies where the matching vehicle is. Despite common belief, booters don’t have vehicle owner information or details about tickets owed. When a matched vehicle is accessibly parked, Porter, towering at 6’4”, said he has to act swiftly installing the boots. “The last thing you want is a confrontation with an angry owner. We have no choice but to think fast on our feet and de-escalate the situation. You don’t want to make the wrong judgment and end up getting chased down the street with no protection,” Porter said. Booters work all over the city from high crime to high-end areas with only one person per van. Porter said there’s always an element of the unknown when installing or removing boots, and he tries to perform the job as quickly as possible usually in under one-two minutes. Porter was ordained as deacon of Gospel Way Covenant Church, 8152 S. Saginaw, in 2005 after being involved in the church for much of his life. A lifelong Chicagoan who has raised three kids in the city with his wife, Porter’s youngest son shares his calling to help others. A freshman at the College of DuPage, Porter’s son achieved the highest rank of Eagle Scout, and he is testing for the Chicago Fire Department. When he’s not working with the church or for the city, Porter said he enjoys camping, fishing and spending time with his family.